This comes from a game taken from my last tournament. White just made a huge moyo and seems to be leading. How is it that there are 20 white stones and only 8 black stones? black proceed with this move, and i couldnt find a way to stop it... black finally managed to reduce this by more than 45 points and won the game. So... how do we stop such a reduction more effectively ? dnerra: First two general comments: 1. These late middle game/early endgame situations are among the hardest for amateurs I believe; unlike in fuseki, very small mistakes can lead to 5 point losses, and a little more misreading to 15 points damage. 2. Please please post full-board positions (the rest of the board makes a difference more often than you may think), and please post the continuations in the game. It is so much easier to give helpful comments when we can point out what you could have done better in the actual game sequence, rather than giving comments about what you should have done in general terms. Dieter: First, the moyo was huge, so an invasion would always been succesful. Second, the top is one line larger (and also weaker) than the right, so blocking there may have been better. Third, after you still have a large share of the top. Iago: Do you mean blocking this way ? 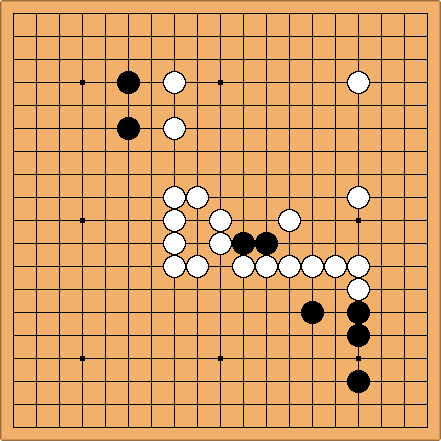 on the previous diagram, it still seems that black can erase all territory on the East side; isnt there a move like white 4 at "a" to stop him short ? Dieter: But I cannot imagine that you lost 40+ points, on top of the corner invasion. You'll have to show me where they are. dnerra: Not sure what Dieter meant, but this is not good for White. dia. Dieter: This is also possible. Black cannot reply at a.
Dieter: BTW, if here I believe that is bigger than . 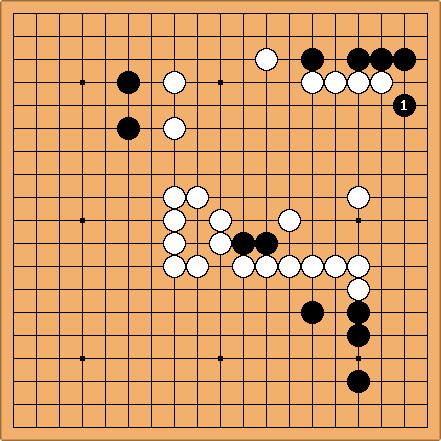 As Black ignored the marked stone, it is natural to punish this by playing . 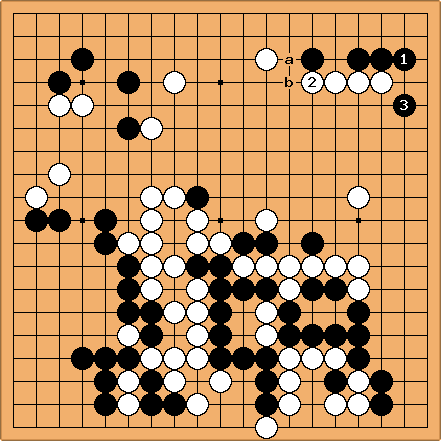 As Black ignores again, it is equally natural to punish this with (after the important exchange / ). 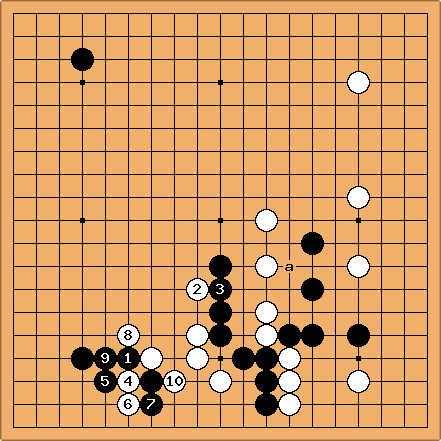 The crucial point now is that Black is not alive yet! 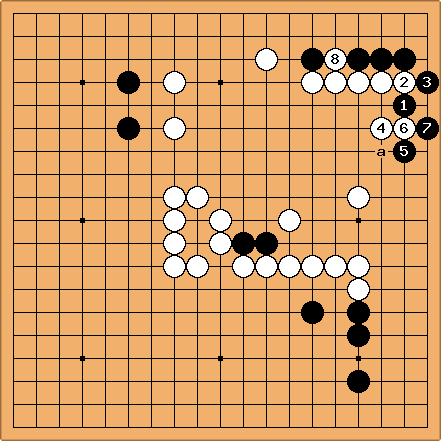 This makes it very difficult for Black to reduced the moyo aggressively. If Black makes life at the top with - , you can stop Black with and Wa from doing too much damage to your moyo. 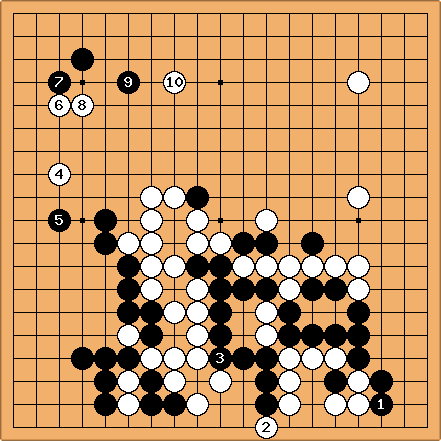 Even after giving way a little more on the right, I think White's territory is still a little larger than in the standard sequence, while Black has less territory in the corner (about 7 points). If Black continues differently with , it gets really complicated. I would be surprised if Black can live here. tderz: Black understands above threat and has to play lighter ... With this technique, I would be surprised if Black can be killed here. San-san invasion black a to i show just one example, even if Black accepts to be made heavy as tachi + above. As dnerra pointed out above, we are eager to see the beginning of the game. Iago: my, you asked for it ;) here is the full game. 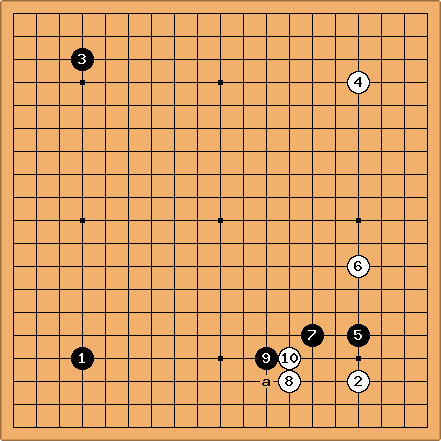 i asked only about this last move because the beginning was commented during the tournament. level is about 6k (or supposed to ^^ ) and i am playing white. 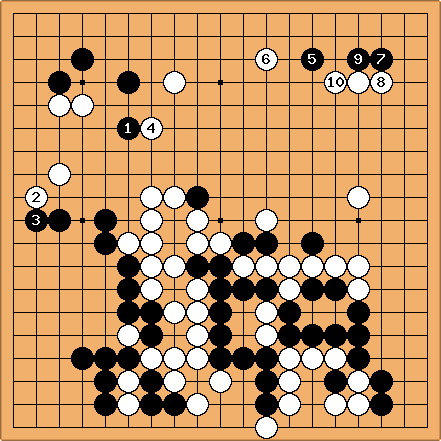 up to , the position occurred in pro-game (i checked on gobase) and the pro move is at "a". is played as a kikashi, to take advantage of black poor shape ( ); however and the next moves show that i didnt keep up with the kikashi idea, i often cling too much on my kikashi stones. would be better at "a" i think. plus it suppresses the possibility of a later Wb. (in order stabilize) is just bad. definitely not the way to handle kikashi. now i am in trouble, i have to stabilize. sacrificing at helps, but thats expensive. the kikashi at , should be followed (preceeded?) by another one at "a". now is painfull. i should have played at "a" instead of 46 in the previous diagram. and now the moyo is formed and we are in the position of my question. actually, my idea was more to make a page about the one point jump as a yose move, like the one about the MonkeyJump. explaining how to deal with the move in case the territory is low (as in the actual page) or high as in this page. also please note that black can exchange "a" for "b" (i am not sure when he did; but he did). tderz: One further question for ease - could you add an SGF link? (did you play on a server?